Mini Mania's on-line ordering system is secured through SSL encryption, and our customer database resides behind firewalls for protection against electronic intrusion. Mini Mania does not sell or distribute its customer list or mailing lists in whole or in part to any unrelated third party companies. Any information you enter in our on-line surveys is kept in a database which is separate from your name and address which you might enter on a separate screen. We have no way to correlate data between the two databases. Approximately every six weeks, we mail our latest sales flyers targeted to cars you own, according to our records. If you wish to stop receiving any of our sales flyers or other occasional mailings, please call our office or send an email to info@minimania.com; let us know your customer number, and we'll remove you from our mailing list promptly. 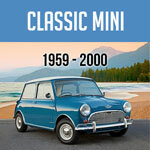 From time to time we send out e-mail newsletters, geared toward either Classic Minis or New MINIs. If you prefer not to receive these newsletters, please follow the UNSUBSCRIBE instructions at the end of the newsletter. Every attempt is made to remove your name from the e-mail list in a timely manner; however if you continue to receive unwanted emails from us, please send a message to info@minimania.com. Monday through Friday, 7am to 5pm. In an effort to offer the lowest possible counter prices, our costs are subject to constant review and revision. We do not rely on artificially high list prices! For that reason, prices in this special offer are good only through the expiration date. Sale prices will be honored through the printed expiration date. Prices on some items are limited to stock on hand. We are not responsible for printed errors in pricing and reserve the right to correct such errors. Domestic: By the least expensive way, usually Federal Express or UPS, unless otherwisespecified. All shipping costs are paid by the customer. Next Day service not available on Internet placed orders. International: By the least expensive way, usually Federal Express for small parcels to Europe, Asia, South America and Far East or DSI for larger shipments above 37 kilograms, unless otherwisespecified. All shipping costs are paid by the customer. Next Day service not available on Internet placed orders. COD orders not available on international orders. Core Charges: Some rebuilt items require exchange units. To receive core refund, return serviceable core along with copy of your invoice. Shipping cost is the responsibility of the customer. Payment: We accept various means of payment: C.O.D., VISA, Mastercard, Cashires check, money order. UPS/FedEx charges $15.00 for C.O.D. service. C.O.D. orders must be paid by cashiers check or money order. COD orders are not accepted for shipments outside of the United States. Returned checks will be subject to a $25.00 service charge. If the check is not satisfied within 30 days, after notification, it will be subject to 3 times the amount of the check, no less than $100 or more than $500.00, plus the amount of the check. Warranty: All parts are warranted against defects in material and workmanship. Warranty will not cover labor, failure of related components, failure from faulty installation or misuse, nor will liability exceed the cost of the original component. With all claims, a copy of the original purchase invoice must be provided. Satisfaction Guaranteed: All sales are guaranteed to satisfy your expectations or the product may be returned for credit within 15 days (Shipping charges NOT refundable unless product is defective). A 20% restocking fee will be charged for returns after 15 days. No returns of special orders, books, videos or electrical components. 800 Numbers: Our 800 numbers are designed to help you place your orders quickly and easily. Please have your customer number, (From your mailing label) part numbers and sale price available for our order processors. (800) MANIA01 (800-626-4201) Toll free FAX line. Products shipped by Mini Mania are properly packaged and protected; therefore, damage in transit is the responsibility of the carrier. If a package appears damaged when you receive it, indicate the condition of the package on your receipt from the carrier. If damage is discovered upon opening the package, notify the carrier and Mini Mania immediately. Damage claims are handled through the carrier. Be sure to retain packing materials for carrier inspection. Claims for missing items or error in shipment must be reported within 5 days of order receipt. 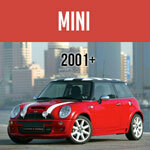 We at Mini Mania value your satisfaction. We back up every sale with our Satisfaction Guarantee: If you're not fully satisfied with our products or service, we'll refund the purchase price. Returned items must be in original condition, in original packaging, unused, uninstalled and re-salable, with all documentation intact to be eligible for refund or credit. Electrical Components, VHS Tapes, DVDs, Software or Software Devices, Books and Special Order or Custom Built Items cannot be accepted for return. Call Mini Mania right away for a Return Authorization Number (RA#), with invoice in hand. Mini Mania will refuse unauthorized returns. If possible, speak with the Sales Tech who took your original order. A return authorization number will be provided for eligible returns. Include a copy of the original invoice in the box, including the completed return form included with the shipment. Include the RA# on the invoice, return form, and on the shipping label. Do not include the name of the Sales Tech who provided the RA# unless instructed to do so, or return processing may be unnecessarily delayed. Mini Mania must receive returned items within 15 days of your original receipt of the product to be eligible for a full refund. Items received between 15 and 45 days from date of receipt, or received without a copy of an Invoice, Return form and RA# are subject to a 15% re-stocking fee, and are eligible for store credit only. Returned items are subject to inspection prior to issuance of refund or credit. Credits or exchanges cannot be issued for used or incomplete returns. Items determined as ineligible for credit can be shipped back to the customer upon request, at customer's expense. Unclaimed ineligible return items will be disposed of after 30 days. Mini Mania, Inc. Attn: Returns Dept. Package your return merchandise carefully. Credit will not be given for returned merchandise damage incurred in transit. No UPS Call Tags will be issued. With the exception of returns caused by our error, shipping costs for returned items are the buyer's sole responsibility. We do not accept returns shipped to us "COD Freight", nor do we pay outgoing freight charges. Please allow up to 3 weeks for your return to be processed and credit applied or refund issued. Credit may take up to 2 billing cycles to appear on your Credit Card statement. If you do submit ratings and/or reviews, you grant Mini Mania Inc. a nonexclusive, royalty-free, perpetual and irrevocable, right to use, reproduce and modify, as we deem necessary, such content on any of the MiniMania.com websites and in other marketing materials. You represent and warrant that you own or otherwise control all of the rights to the content that you post, that the content is accurate to the best of your knowledge and belief, and you agree to indemnify and hold harmless Mini Mania Inc. and its directors, officers and employees from any resulting liability. Mini Mania Inc. takes no responsibility and assumes no liability for any content posted by you or any third party.